Last Saturday, I was home alone. My wife and daughter left to see family, and I had the whole day to myself. No commitments, nothing to do, nothing that needed to be worked on… except maybe my Master’s Thesis. But hey, how many days to you have to up and go fishing all day? Back in February, I made a trip to Lake Ogallala, Nebraska and went trout fishing in moving water for the first time. It was a blast… and while the vast majority of my fishing is warm water fishing, I do have to say that the thought of trout fishing is exciting. 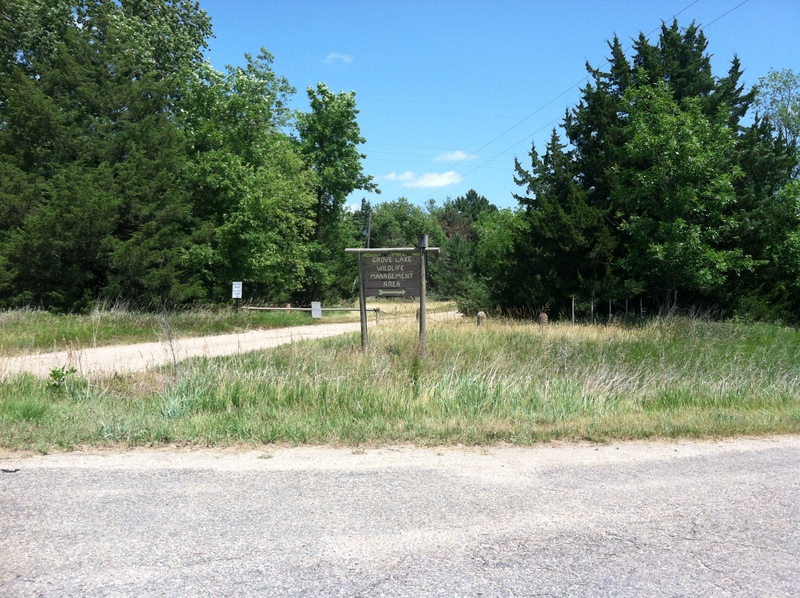 The closest “trout stream” to Lincoln is a little place called East Verdigre Creek. I had seen some people on a blog that I follow talk about it, and had nothing but good things to say. Verdigre Creek is a small stream about 3 feet wide. And best of all, it is located mostly on public lands. 10:00 AM Saturday morning, I decided that making the trip would be a good way to send my day. I started by trying to walk along the creek and sneaking up on any unsuspecting trout lurking along the edges… except the grass along the edges was shoulder to above my head high. So I decided to walk in closer to the creek… and then I would step in hidden wash outs and fall on my face. I did this about three or four times, and felt like a turtle trying to roll himself over each time. I frantically starting looking everywhere for my wallet. After a few seconds, I spotted it… floating down stream in the creek. Several splashy steps later it is recovered. And any hope of finding a fish in this section of the creek is gone. So I waded further upstream. I did manage to spot a couple of trout… as they darted between my legs after I about stepped on them in the weeds they were hiding in. After about an hour of falling in and out of the creek, I gave up. Verdigre Creek is the tributary of Grove Lake, and being mentally prepared to get skunked on the creek, I decided to break out the float tube and fish the still water. I fished for another three hours in the lake, had one fish throw a hook, and landed two… if you count this as one that is. 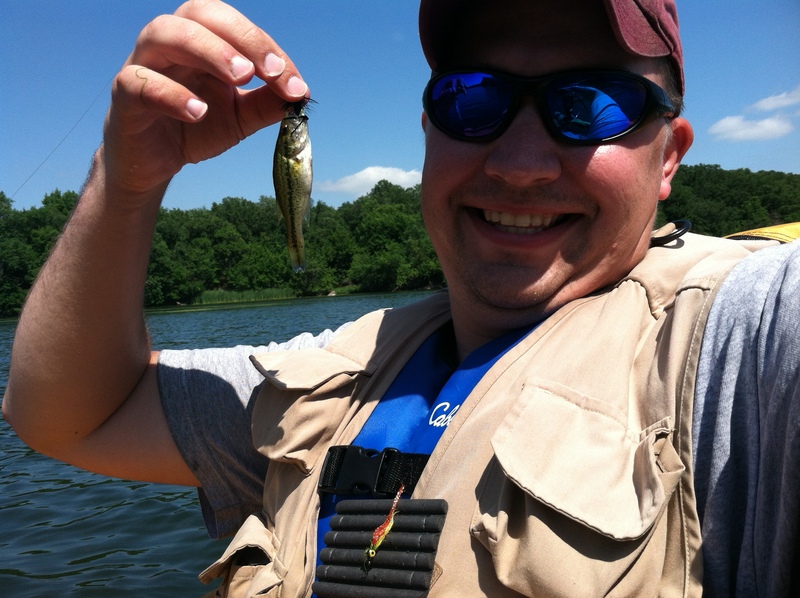 It is a record for me as being the smallest bass on a fly I have ever landed. After throwing a different combination of Clouser Minnows and Woolly Buggers in a variety of colors, I did manage to land one more fish… a Bluegill. Now, bluegill are one of my favorite fly fishing targets. 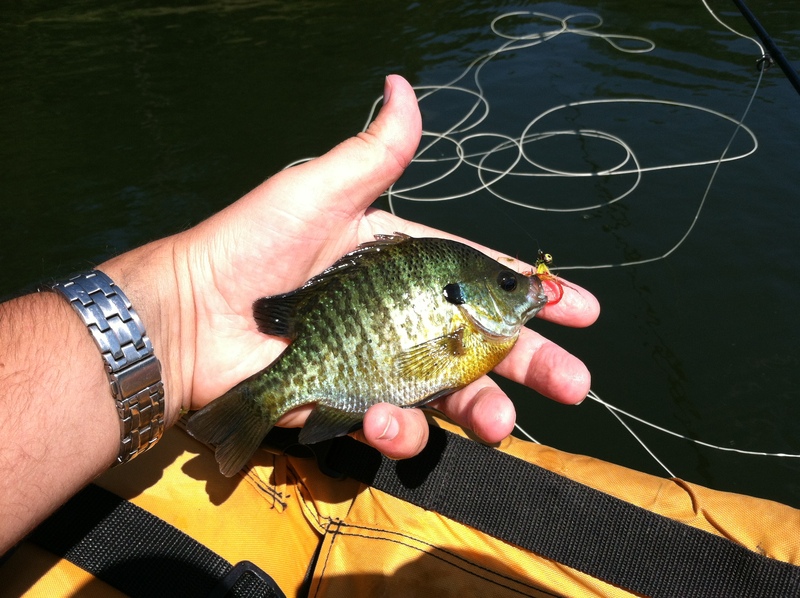 Call them easy to catch, call them small, call them whatever you want… I love fly fishing for bluegills. This particular fish had quite a look to it. Sharp lines, beautifully patterned scales… awesome. I love seeing how bluegill in different watersheds have slightly different appearances . Okay, so this fish is no record setter on its size. But for me, size is not every thing. I measure my success in fishing in a simple formula: Fish Caught vs. Flies Lost. Based on this formula I guess I did “win” the day… 2 fish landed vs. 1 fly lost. But if we break it down based on the body of water I was on, the score would go: Grove Lake: 2 Fish vs. 0 Flies Lost, Verdigre Creek: 0 Fish vs. 1 Fly Lost. I guess you win some, and you lose some. And I only saw one other fish caught on the lake while I was there… so if no one is catching fish, they must not be biting, right? 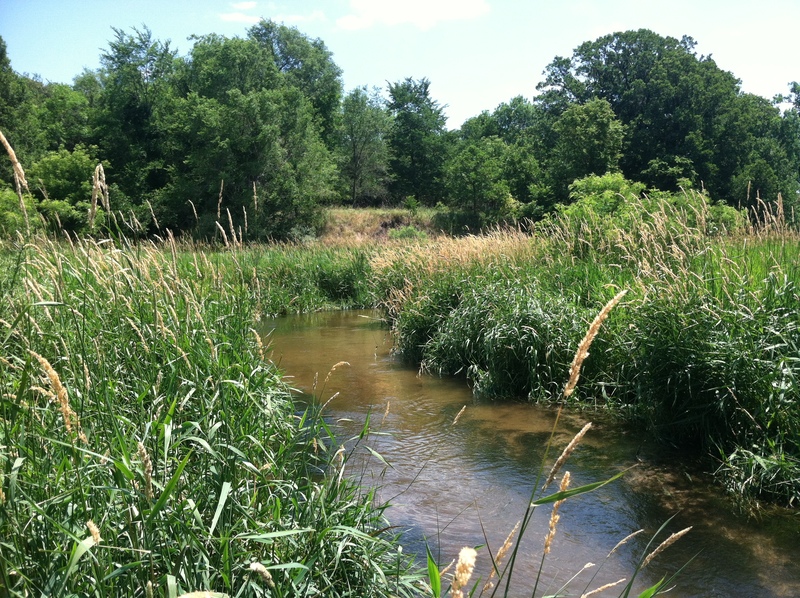 Before I went home, I did try to fish a different section of the creek… one that had been recommended by a fellow fisherman on the lake as having more trout… but I found the same experience as the first attempt. Like the song goes, “you have to know when to hold ’em; know when to fold them”. What I learned that day is that I am no small stream fisherman. Don’t get me wrong, I didn’t regret the trip. 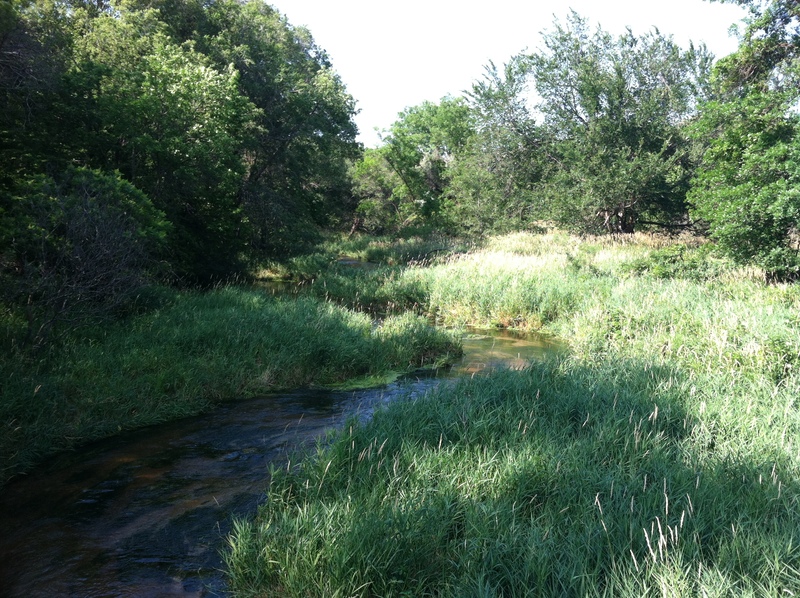 But when I get the itch to go trout fishing again, I think I will head west to Ogallala again!